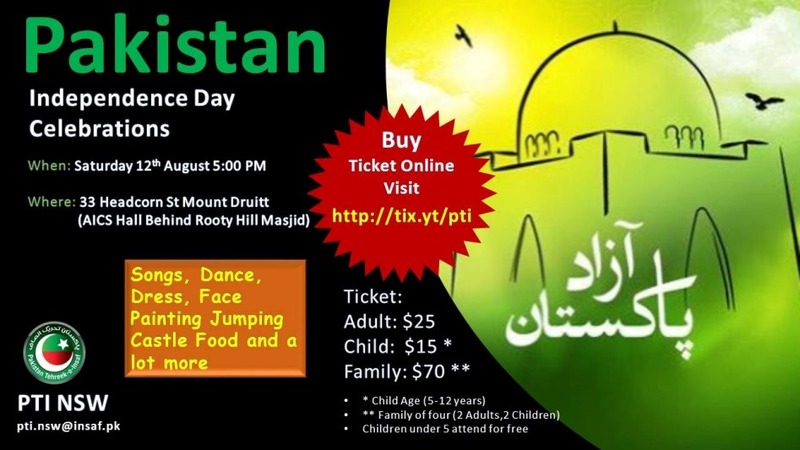 I want to bring kind attention of readers of Sada -e- Watan that Pakistan Tehreek-e-Insaf Australia is arranging to celebrate Pakistan’s Jashn-e-Azadi/Independence Day on Saturday 12th August 2017 5.00 PM at AICS Hall, 33 Headcorn St Mount Druitt Sydney NSW. We are expecting a huge community members will attend this event Insha Allah. This function will be full of fun and activities for all age groups (like Kids activities, Jumping Castle, Face Painting, Dress show, Quiz and lot more. Further details about the event, updates and tickets information can be obtained by visiting the Facebook Event. On behalf of Elected Team of Pakistan Tehreek-e-Insaf Australia (NSW Chapter); we wish to invites all Pak community with your family.